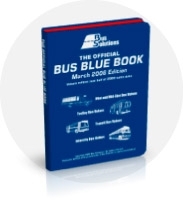 This Official Bus Blue Book is a complete used bus valuation guide. The book gives you benchmark pricing on thousands of used coaches throughout North America and Canada. In addition, the publication has great historical value providing information regarding both manufacturing dates and specifications. The Official Bus Blue Book is geared towards companies and individuals directly related to the Bus and Coach Industry. Dealers, insurance companies, lending institutions, operators and anyone needing to determine exposure and evaluate or appraise coaches have all found that the Official Bus Blue Book is a powerful source of used bus information. The writers and gatherers of the data that go into the Official Bus Blue Book publication have over 60 years combined experience in the bus and coach industry with over 25 years experience directly relating to this type of publication. Bus Solutions is continuing the tradition began seventeen years ago by providing professionals like you with accurate used bus pricing information. The book contains detailed options, mileage and major component schedules information including the most recent 25 years' worth of equipment. Over 8300 different makes and models of buses. Published semi-annually, in March and September. The March edition is reflective of actual sales transactions during the previous July-December period. The September edition is reflective of actual sales transactions during the previous January-June period.